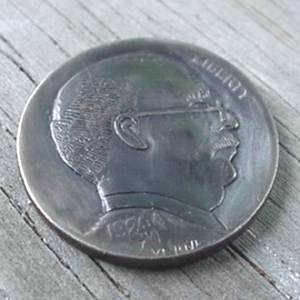 More Recent and Vintage nickel carving coverage... stick closer to our organization's focus. 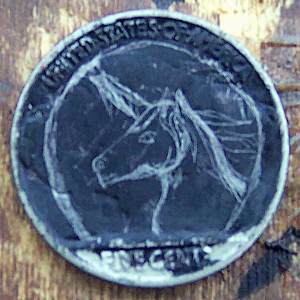 Less Recent nickel carving coverage... stick to Vintage nickel carvings. More broad general interest coverage... subjects related to hobos, trains, etc. are enjoyable. The current catch-as-catch-can coverage is just fine... everything is going well as it is. I find little of interest or value to me in the Latest News subjects. This WebPoll no longer works - FreeWebWare.Com allowed their domain to go inactive on 11/12/2004. 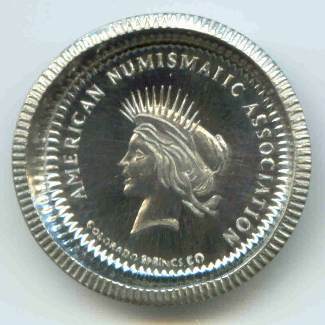 for MORE... MORE recent nickel carving items and MORE general interest items. 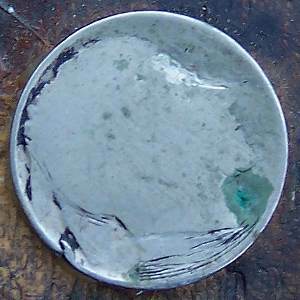 An additional 39% found the current mixture of articles to be just fine. which has been a subject much discussed in previous OHNS Board correspondence. XIII. 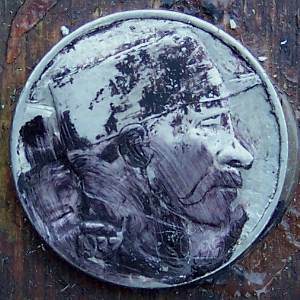 Hobo Nickels: Approximately 93 slides of truly artistically carved (from Buffalo 5¢'s) "Hobo 5¢", many done by "Bo." "This is the introduction I read on the cassette tape that accompanies my first slide series." XIII. 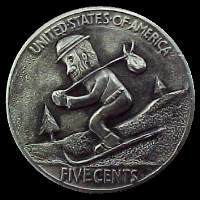 Hobo Nickels: Approx. 93 slides. XXIX. 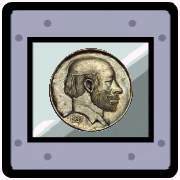 Hobo 5¢ - Part 2 ("Bo's Best"): 61 slides. 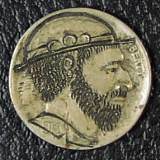 XXXI. 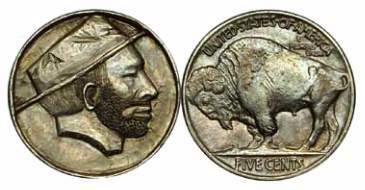 "Hobo Nickels" on Other than Buffalo 5¢: Approx. 20 slides. XXXIV. 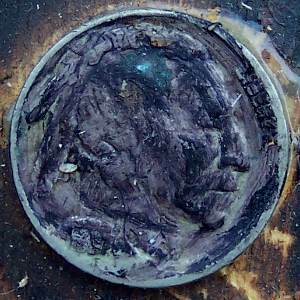 Hobo 5¢ Grading: 57 slides. The "slides" shown here are mockups created by your Webmaster using some of Bill's "Bo" carvings... not the actual slides. 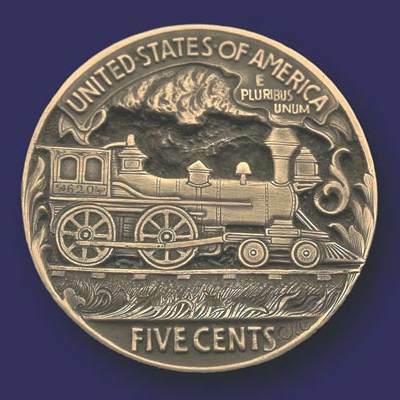 Mooney's works of art depict the evolution of the steam engine in sixty-four carvings. 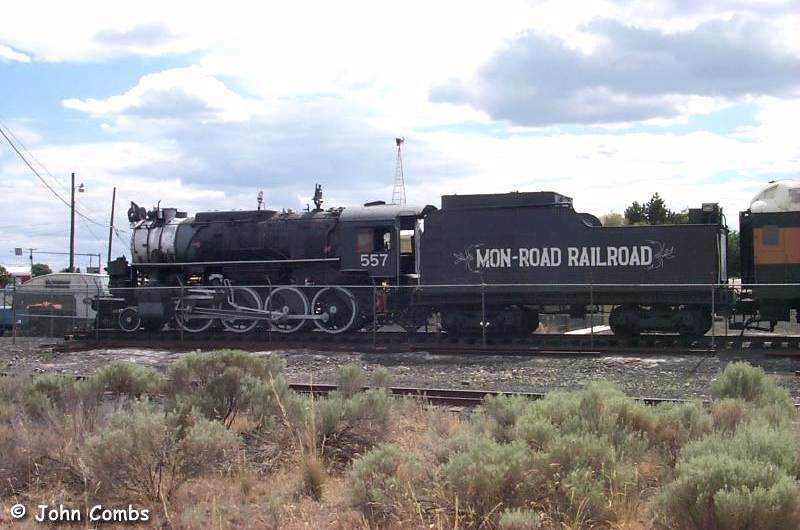 It starts in 250 BC with Hero's Engine, and ends with the Union Pacific Big Boy Locomotive of 1941. 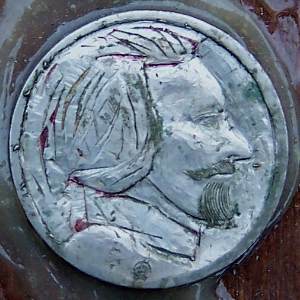 His first fifteen carvings were of bone and walnut. In 1933 he completed his finest work, the Great Northern Locomotive. 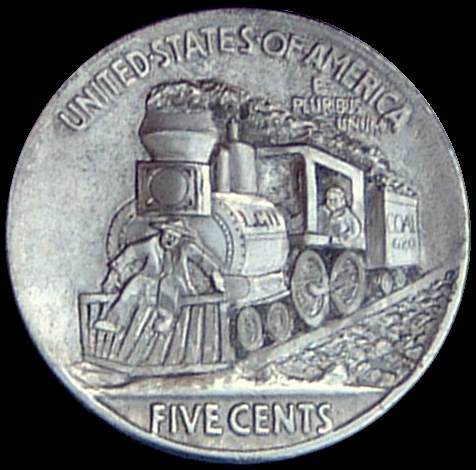 In 1953 at the age of 68 he completed his 54th carving; the Union Pacific "Big Boy" locomotive. At age 72 he started his great work, "Great Events in American Railroad History". These carvings included a solid ivory representation of the driving of the golden spike on the transcontinental railroad. 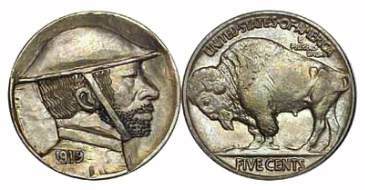 He also depicted the great locomotive chase of the Civil War, the Casey Jones locomotive and the first passenger train, the John Bull. His largest project is the 8-foot long Empire State Express. 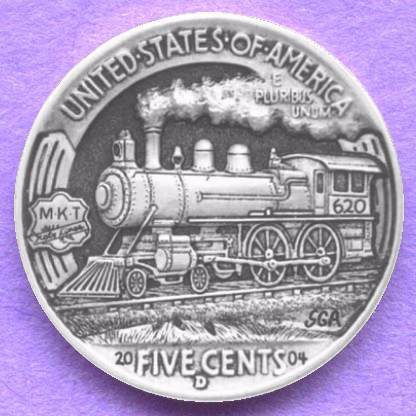 At age 80 he carved the Lincoln funeral train in ebony and ivory with mother of pearl accents. 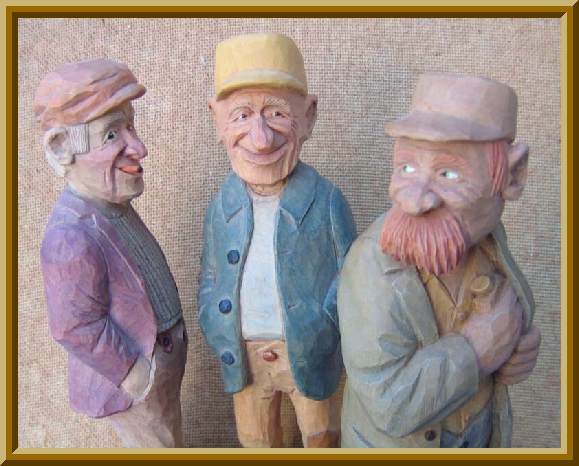 To read and enjoy The Internet Craftmanship Museum's full article "Ernest 'Mooney' Warther - 'Whittling' doesn't even begin to describe this type of wood carving." visit website: www.CraftsmanshipMuseum.com. The "Big Four" 4-4-2 Atlantic, Union Pacific "Big Boy", New York Central 4-6-4 Hudson and "The General" (an 'American type' Locomotive stolen by the North during the Civil War ...single photo above) have coal cars but no additional cars. The Empire State Express has a coal car plus four additional cars while the Lincoln Funeral Train has a coal car plus three additional cars. 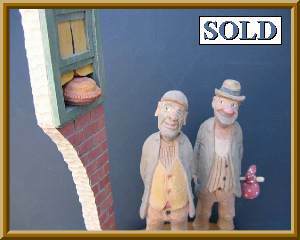 While many of Mooney's carvings have something like 7,000 individually carved pieces to make the complete model, some have well over 10,000. The finest hardwoods, ivory and mother-of-pearl were his medium and the superlative results clearly demonstrate the worth of investing in high grade materials. His family maintains a museum in his honor in Dover, Ohio. For full particulars visit the museum website at: www.Warthers.com. Hours of operation and explicit directions to the museum are available here: The Warther Museum & Cutlery Shop, located at the gateway to Ohio's beautiful Amish Country, is easy to find. Take I-77 to the Dover exit (#83) and follow S.R. 211 East 1/4 mile into Dover. Their entrance is right at the first light after the railroad tracks. Click on photographs for enlargement. Twelve miles or so down river from Wenatchee, Washington is a wide spot in the road called "Rock Island". This "town" was named for a couple of large rocks that protrude from the middle of the river just above the Rock Island Dam. As a young boy I would see hobos following the tracks that ran along both sides of the Columbia River. unless it is a "borrowed" hot apple pie on a cold winters day. a drink with West-Coast Willie; exceptin' Willie don't know it yet. can't wait to sink his gums into his share. Won both "Pacific Northwest Caricature Carvers"
and "Caricature Carvers of America" awards. BEAVER - He should have spoken to the hobos down by the railroad tracks in Ellwood City during those summers 40 years ago. 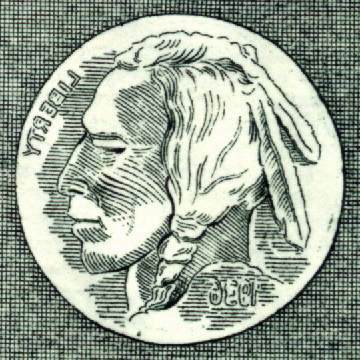 Mike Cirelli might have happened onto a hobo using hammers, nails and handmade tools to engrave a new face on the Indian head of a buffalo nickel. 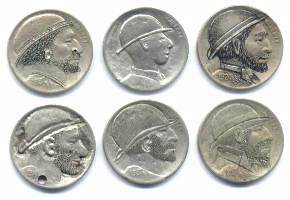 If they had talked, the 47-year-old jeweler probably would know more now about the down-and-out men who, during and after the Depression, hopped railroad cars and came to town looking for work, a night's lodging or a meal. 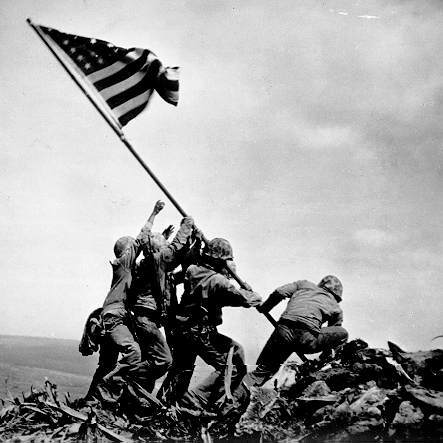 The Six Flag Raisers On Iwo Jima ... To read about Mike Strank, Harlon Block, Franklin Sousley, Ira Hayes, Rene Gagnon and John Bradley simply go to this webpage: Iwo Jima - The Flag Raisers. 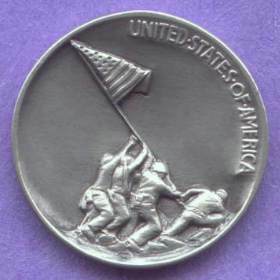 This is just one of the many great resources available on website: Iwo Jima. When Steve Adams sees something challenging he just can't resist. 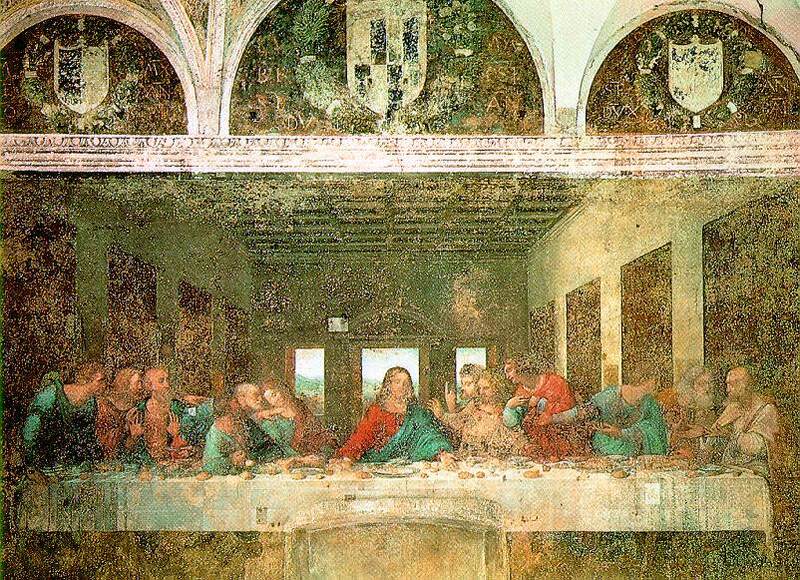 After Steve carved Da Vinci's "Self-Portrait" for me I asked if Leonardo's other masterpieces, like his "Last Supper", were next on the "to-do" list. 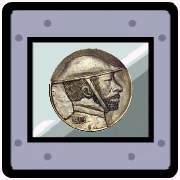 He told me he had already done the "LS" but it was in 10 inch medal format. 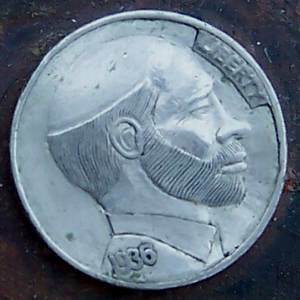 He allowed as how he thought Lee Griffiths ought to tackle the "LS" in nickel format. 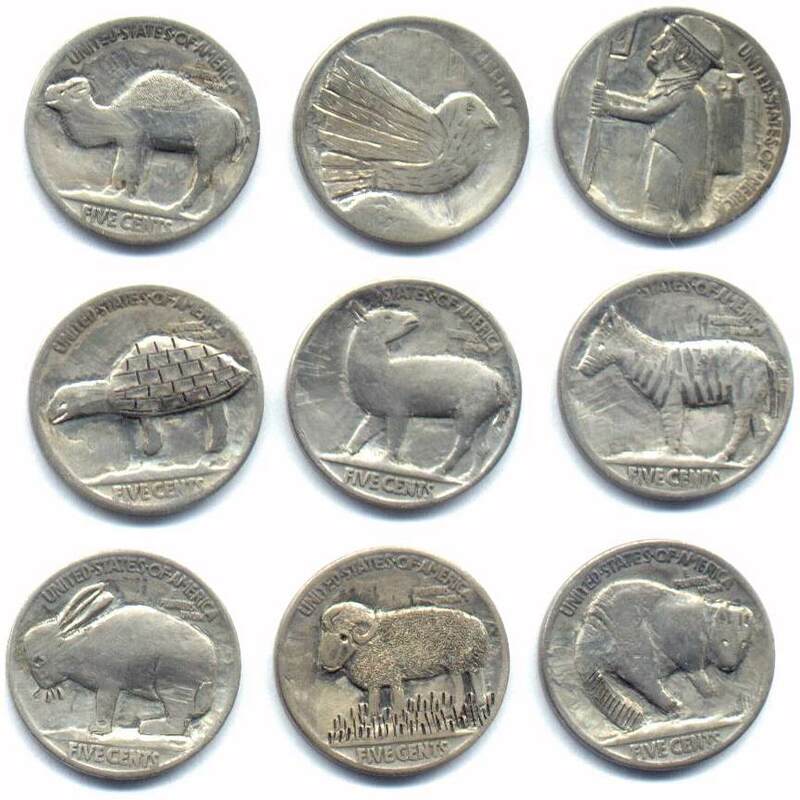 My MOST FUN was the thirty recent nickel carvings I carried with me everywhere. Whenever I found the opportunity I hauled them out for show-and-tell. Without fail these pieces were met with amazement and I always drew a crowd of excited on-lookers. Naturally I'm gratified that everybody shared my enthusiasm! "Tasks left undone must stay that way." Arthur "Hutches" Hutchison left us April 2nd of 2004. He died at home and will be greatly missed by all who knew him. 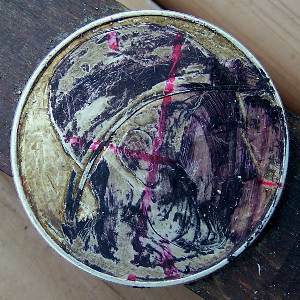 I was just contacted by a gentleman who purchased a box of material from Arthur's workshop. Much of it had gotten wet and was rusty but included were these unfinished carvings. People outside the family seldom gets to see this sort of material so I am documenting it here for those who are interested. All Y'all Can Be Hobos ... I wanta be the Engineer! - While you guys and gals are freezing off body parts trying to cop a free ride... I plan on being up front out of the weather where it is warm and getting paid for riding the same train. We would both get to enjoy the same countryside views and travel itinerary! Now where did I put my lunchbox and cooler? 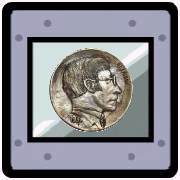 This image has been "corrected"
One could always hope that this original art print by Christopher Madden , banknote picture engraver with the Bureau of Engraving and Printing and president of the Banknote Engraver's Guild, will become a rarity similar to the infamous 1918 inverted Jenny 24c stamp... but most likely it won't. 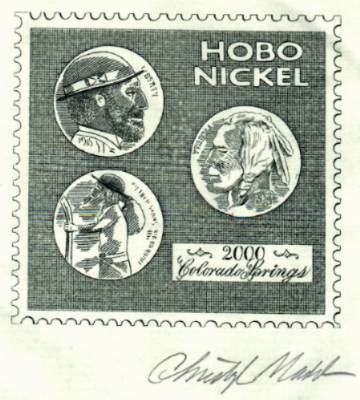 I acquired this print from Chris at the 2004 ANA Summer Seminar and noted that the "Indian" was engraved in mirror image. Chris said he hadn't noticed this and had never had it pointed out to him previously. 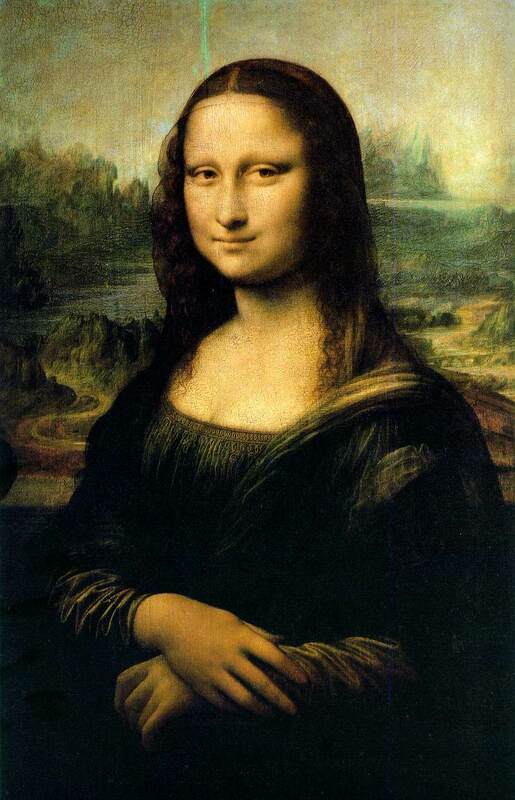 I reckon we can just say that Chris took "artistic license" rather than "he goofed." It is his artwork and he clearly ought to be expected to do it however his Muse moves him! 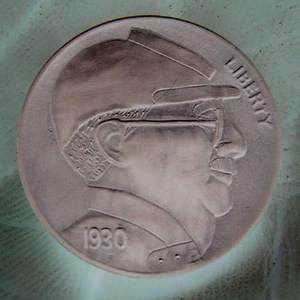 Here is a neat newspaper article about Chris' "day job": Old Hands Create a New Line of Money, Treasury Engravers Do Their Painstaking Work The Old Way - For Now by Barbara J. Saffir, Special to The Washington Post, Thursday, February 20, 2003; Page A37. 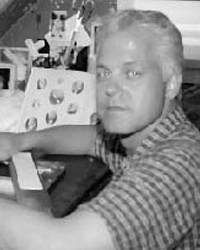 Chris is also an accomplished artist and you can see examples of his work on the The Artist's Gallery - Christopher Madden webpage. Chris gave me an 8.5x11 printed handout that was clearly produced for an art show that he had work shown in... you can read it here: Christopher Madden: Artist ~ Engraver ~ Painter. 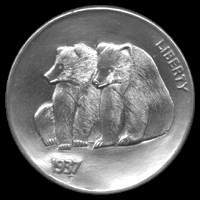 The Grat Brothers Try Nickel Carving - Many of us have given serious consideration to carving nickels but few actually make the attempt. Timothy Grat is the Chief Coiner at GMM and Tony Grat is his brother who helps out around GMM as demands dictate. 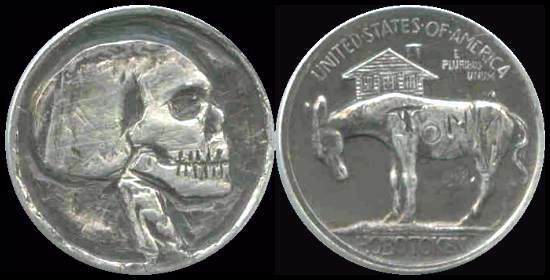 Tony used one of Ron Landis' silver annual hobo tokens for his Death'sHead carving and Timothy used a recent Jefferson nickel for his Pirate carving. Regardless of your opinion of these two carvings... 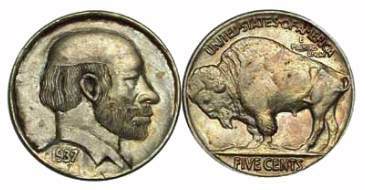 I figure EVERY nickel carver had to start somewhere. I assert that it isn't a crime to do a crude carving... only to make no attempt to carve up to one's actual capability or to make no effort to improve as experience is gained. Excuse me... I gotta crawl down off my soapbox now! 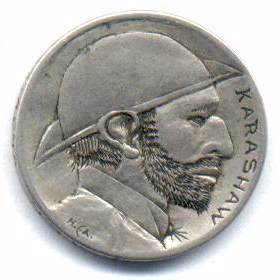 Let me begin by saying that there are few people in this world whose life ambition is to become a professional engraver, or an amateur engraver for that matter. The type of engraving I am referring to is that of an artisan, a person with a desire to achieve works of art with their hands. 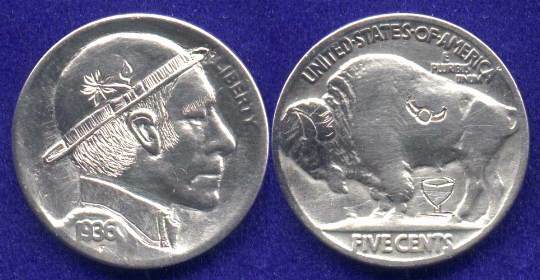 Perusing Old EMail Files ... Carvings From The Desert - While researching my correspondence history today I stumbled over the three reverse nickel carving scans here on the left. 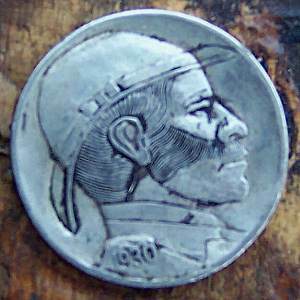 At first I thought that they were the same scans that Fred Benson used in his BoTales2004#1 article "Mike Pezak, Modern Nickel Carver." I had to dig out my BoTales archive and, lo and behold, I found that Fred had actually used the three scans here on the right. I thought you might enjoy seeing four of Mike's better carvings. I personally prefer the carving with the hammock because all the original legends were left undisturbed. Not everybody likes the same thing so others among these carvings may well be precisely your cup of tea. 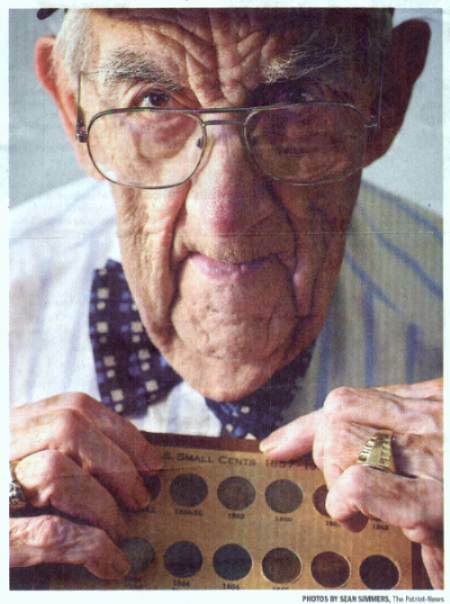 September 2002's VIEW NEIGHBORHOOD NEWSPAPERS ~ 20 September 2002.
his collection of Indian Head pennies from the 1800s. 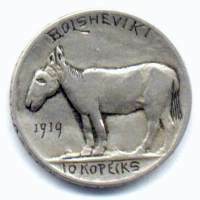 at a recent coin show in Florida. 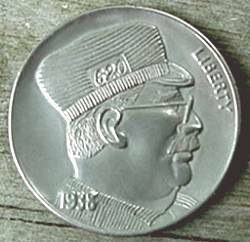 Man strives most of life to acquire Coin With A Signature - To look at Newell Shireman now, at 90, it's hard to imagine him riding the rails. 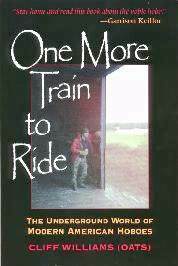 But ride them he did, along with a lot of other Americans when the nation was trudging through the Great Depression. 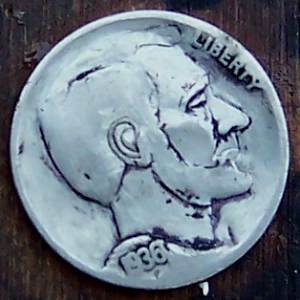 After Shireman graduated from Middletown High School in 1933, he hitchhiked to the Chicago World's Fair, the first leg on a journey that stoked his fascination with hobo nickels. 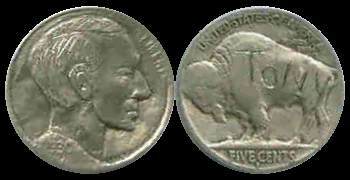 From 1913 to 1938, the country's 5-cent piece was the buffalo nickel. The front featured the head of an Indian and the back, a buffalo. Hobos altered the nickels, transforming the Indian into a soldier or a bearded man wearing a hat. 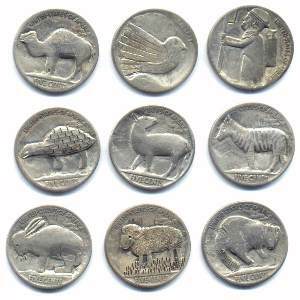 Some changed the buffalo into another animal, such as a camel or a lamb. 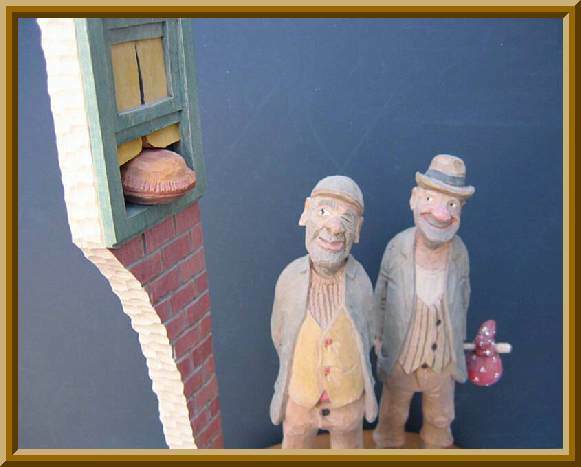 Shireman learned the keys to riding the rails from a hobo named Bert whose trademark nickels carried his name. 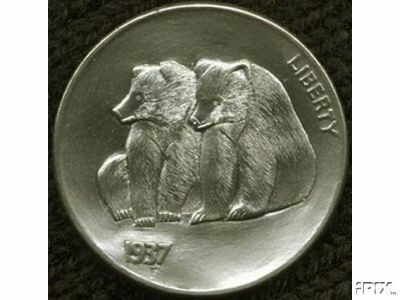 Bert would remove the L, the I and the Y from the word "liberty" on the front of the nickel, leaving his "signature." 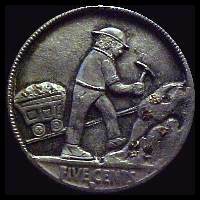 Hobos like Bert modified the nickels with hand tools that Shireman describes as similar to an ice pick and files. 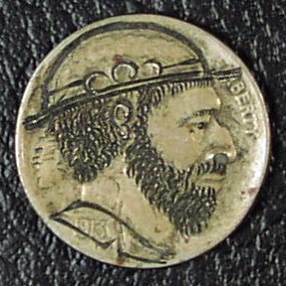 As Shireman recalls, Bert would carve a nickel a night. 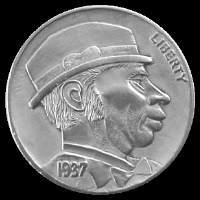 When Bert and Shireman went their separate ways in New Orleans, Bert made him a gift of six nickels. 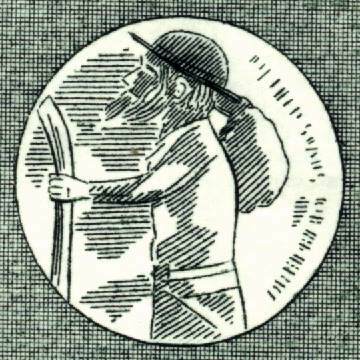 But Shireman used them, as hobos did, as a thank-you when people gave him a meal. He recalls handing the last one to a woman in Bristol, Tenn., who fed him dinner and sent him on his way with leftovers in a bag. 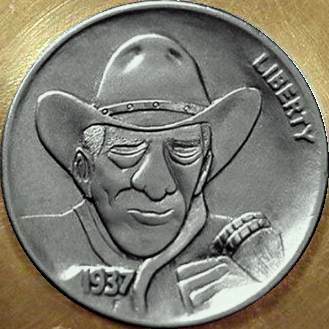 Years later Shireman, back in Middletown and a veteran of World War II and Korea, began collecting hobo nickels. 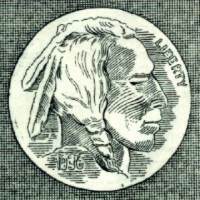 Coin collecting wasn't a new venture for Shireman, the son of a coal dealer. He's been collecting since age 8. 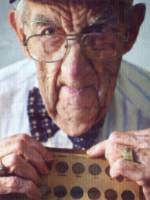 As a teen who earned money selling newspapers, he once spent $20 for a 1909 penny. "Somebody - I don't know to this day who it was - told my father, 'You better watch that boy of yours. 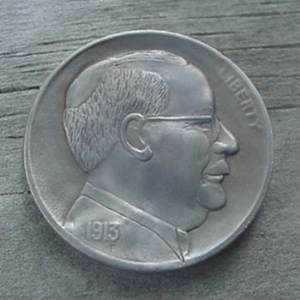 He paid $20 for a penny,'" Shireman said. But it proved to be a wise investment. 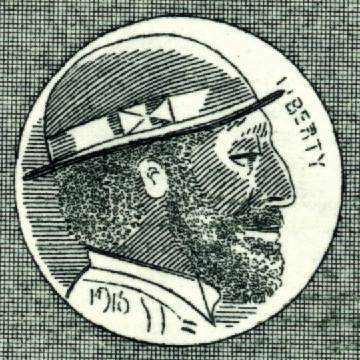 Today, he said, that penny is valued at several thousand dollars. 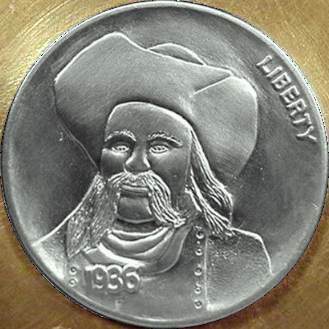 Shireman said he's well-known at coin shows where he prowls for additions to his collection of 100-plus hobo nickels. 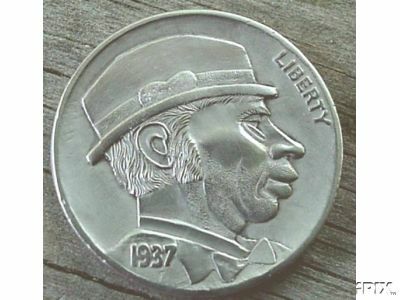 "They all know me and they call me the 'hobo nickel man,'" he said. 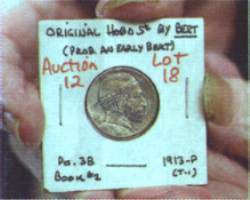 And they all knew that Shireman's collection lacked one thing; a nickel with the distinctive signature of "Bert." 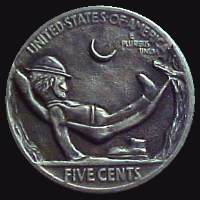 There is, if you can imagine, enough interest in hobo nickels for an organization of collectors. 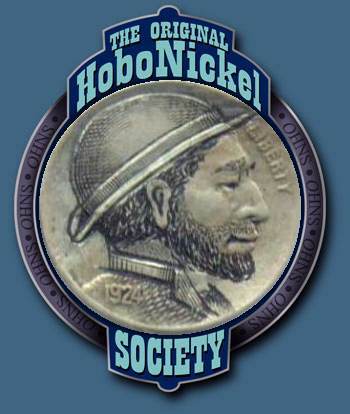 Sure enough, Shireman is a member of The Original Hobo Nickel Society (www.HoboNickels.org). 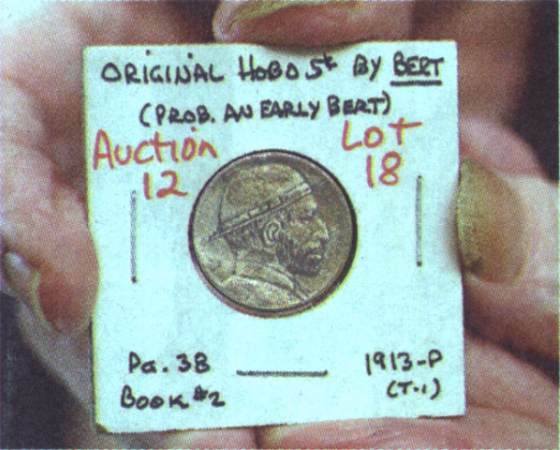 For years, he told collectors and dealers, "I'll pay $1,000 if it's genuine and a good one." Finally, his persistence was rewarded. Last year, as the organization gathered in Orlando, Shireman spent his $1,000 and got a "Bert." The Fabric Of Life - I just returned from a trek into the wilderness of Ontario Canada and, based on previous experience, I knew that one should expect to be "rained in" for some portion of the time allotted for fishing. During this trip we spent two days napping and reading in our cabin. My days of sleeping on rocks in a rain soaked tent are far in my past... Praise The Lord! Reading this book didn't bring on a personal epiphany, a sudden manifestation of the essence or meaning of my own life. I can't say I am a new or better person for having read Monte's book... although that certainly would be nice should it turn out to be true. What I can say is simply that many of Monte's "threads" have been permanently woven into the fabric of V-Dubya's life! Reading this book was an immeasurably enriching experience. 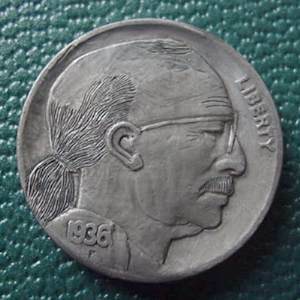 OHNS Nickel Auction 13 Preview - I just got the Goetz auction hobo nickels back from Bill, and I scanned a few of them for posting on our website, in an "Auction Preview" section. 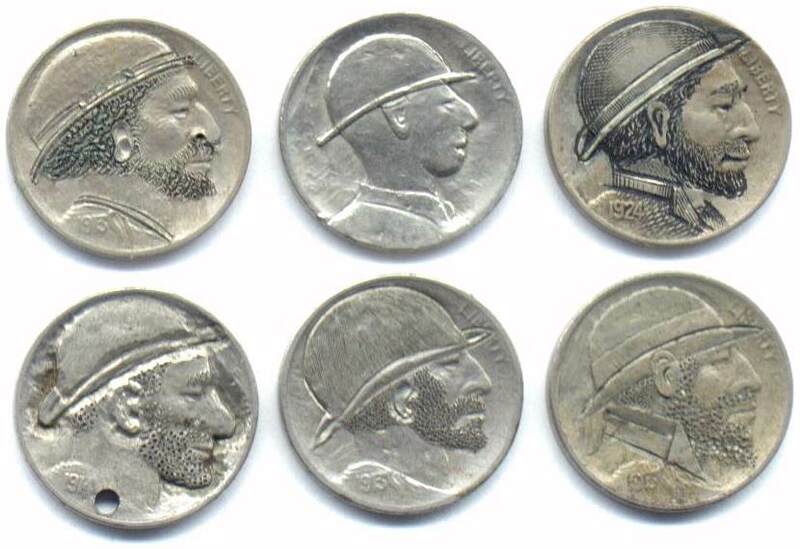 For the time being I think just posting the pictures would suffice, with a note that they are among the items in our 13th OHNS Auction this coming January in Florida. 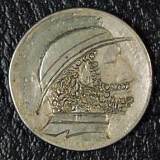 In December, after the auction catalogue is completed hopefully we can put the entire catalogue up on our site. 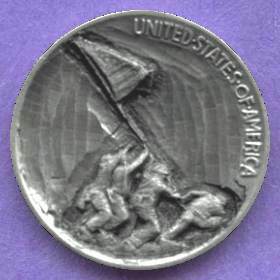 "Group A" scan has 6 of the better old hobo nickels and "Group B" scan has 9 Dorusa nickels. 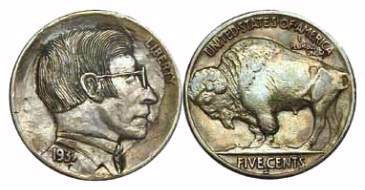 V-Dubya's note: European Numismatists consider the Buffalo side of the nickel to be the "obverse" since it identifies the coin's country of origin... "UNITED STATES OF AMERICA". 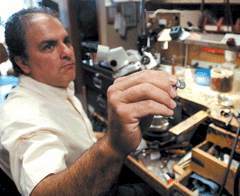 Getting to know talented folks like Jerry sure does enrich our hobby and our lives. Thanks Jerry! Sounds bizarre, doesn't it? But that is what I obtained from an ebay auction just after our January 2004 OHNS meeting in Orlando. 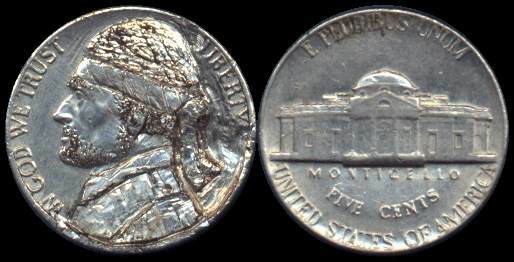 Besides being a high-quality carving with attractive hand lettering on both sides, and on the edge (that's the seldom-altered third side of a hobo nickel, folks), the piece is just smothered and dripping with history. And military history, no less. 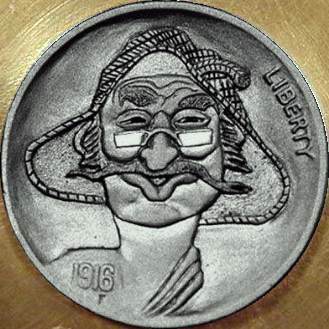 Last Fall (2003) I attended the Michigan State Numismatic Society (MSNS) Fall Convention and Coin Show in Dearborn, Michigan. 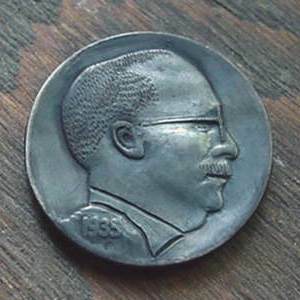 I went the opening day, and as is my practice, the first table I visited was Norm Talbert's (Great Lakes Coin Company). 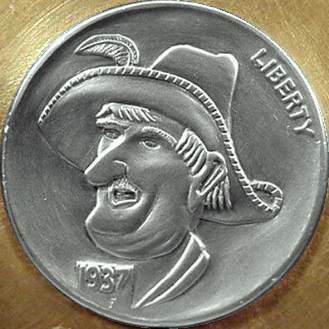 Norm is an OHNS member and an authority on Buffalo Nickels. I had brought along a couple of U.S. Type coins I wished to sell, which I handed to Norm for his examination. 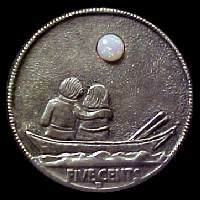 Then I saw the four hobo nickels Norm had in one of his display cases. 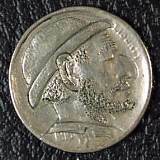 I began examining the hobos. I was definitely interested in one of them. "One More Train to Ride" and "Rough Living"
2-8-0 (S-160 class) #557 Factory: Baldwin Locomotive Works, Year: 1944 Works Number: 70480, Railway lines and Serial numbers: 1) 1944-1945, Fort Eustis as USATC #3523 2) 1945-1960(5/9), Alaska Railroad as ARR #557 3) 1960-1965, Alaska railroad, (graveyard) 4) 1965-2004, Mon-Road Railroad, Moses Lake as MRR #557 Owner: Monte Holm Location: House of Poverty Museum, Moses Lake Iron and Metal Company, 288 Commerce Way, Moses Lake, WA 98837 Tel:01-509-765-6342 Status: On static display. Once A Hobo ... 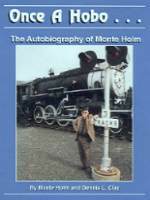 The Autobiography of Monte Holm - Monte, OHNS RM553, wrote his autobiography in 1999 and has it available for purchase. He wrote me a great personal letter in which he said, in part; "I have had a much different life than most people. My Mother died when I was 6 year old and I got a step Mother that kicked me out when I was 13 years old. That ended my home life. 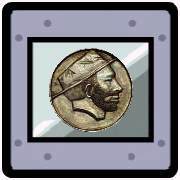 I put in 6 tough years as a Hobo. The Rail Bulls kicked me off of so many trains I told them I will someday own my own train and you won't kick me off. So I have the last steam locomotive to run on the Alaska Railroad and the rail car that hauled Pres. Wilson and Pres. 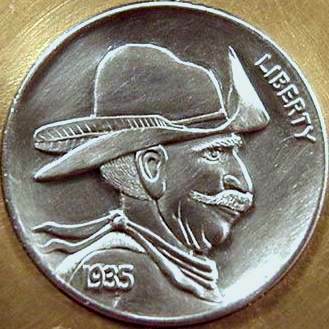 Truman... and no mean Railroad Bull can kick me off. 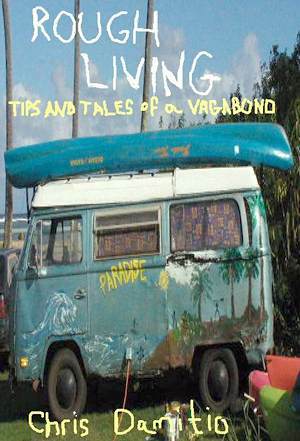 If anyone wants a copy of my book they are $25.00 each and send the check to: Monte Holm, P.O.Box448, Moses Lake, WA 98837 Home:509-765-5532 Shop:509-765-6342"